This 4th of July our kiddos are still too young (in our opinion) to stay up for the fire works show at 10 pm. Kudos to all of you who take your young ones with you to this event. You should get a merit badge. Regrettably, we’re just not up for it! Maybe next year… I do love to celebrate holidays with my kiddos and decided to try and make the day as special as I could without causing my spouse or myself any unnecessary mental illness symptoms. The best part of the day was that our good friends C. and M. came over to play at Bubba’s & Muga’s house. We ate lunch and had 7-up with red, white and blue ice cubes. Then we went swimming and had ice cream sandwiches with red, white and blue sprinkles for desert. We also made this cute craft. 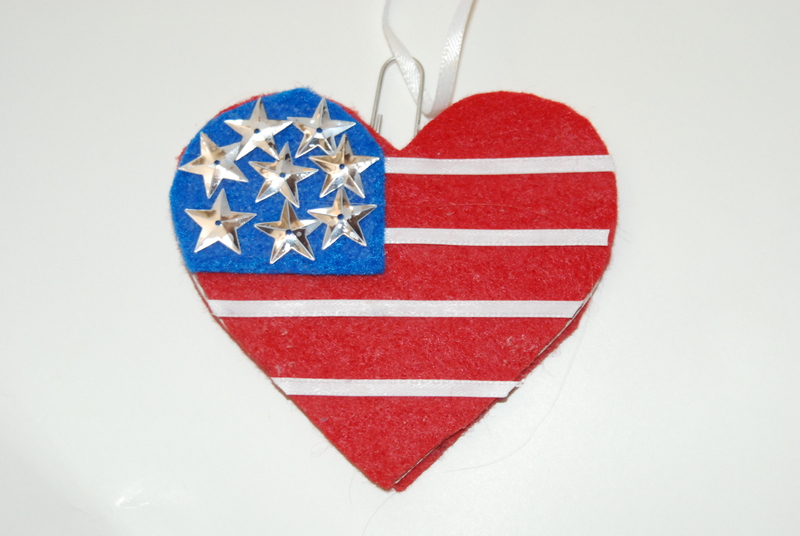 I was inspired by a craft idea in the book “Star Spangled Crafts” by Kathy Ross. 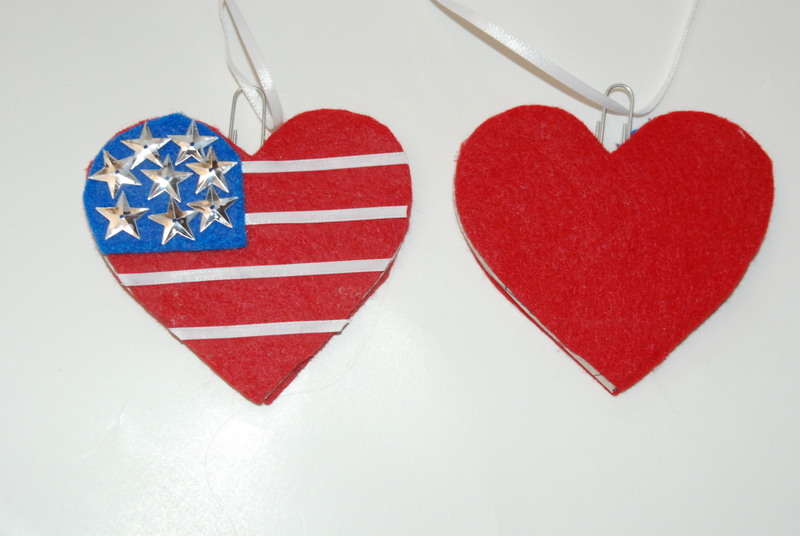 Step 1: Cut out a heart shape or rectangle from the cardboard and the red felt. Step 2: Cut out a blue square to fit in the corner. Step 3: Cut lengths of white ribbon to fit. Step 4: Let the kiddos glue all the pieces together including some sequin stars on the blue felt. 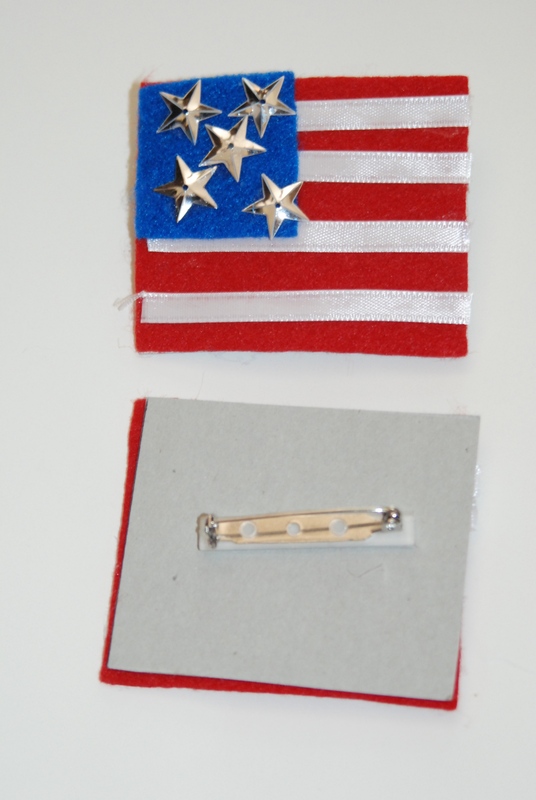 Step 5: Either peel off the sticker back to the pin and put it in place on the back of the flag or use Duck tape to secure a large paper clip to the back of the flag. You might also cover the back of the necklace craft with another piece of red felt just to make it look finished off. Alternative: I think you could make this entire craft with red, white and blue Duck tape or card stock paper instead of felt and ribbon. You could also make the flags of different countries using different colored supplies.